Nuclear medicine imaging is also called nuclear medicine scanning. It uses small amounts of radioactive materials that are injected, swallowed or inhaled. The radioactive material travels through your body to the area being examined. The radioactive material gives off a type of radiation called gamma rays. A special camera called a gamma camera picks up the radiation and uses it to produce images of your body. This picture shows a type of gamma camera called a SPECT/CT camera. A scan can take from a few minutes to several hours, depending on the type of scan. The scans are painless. This video from the Nuclear Medicine Department of Christchurch Hospital shows a SPECT/CT camera in use. Is nuclear medicine imaging dangerous? No. The radioactive material breaks down and leaves your body quickly. Your exposure to radiation is kept as low as possible. Most nuclear medicine scans use no more radiation than an X-ray. Allergic reactions to the radioactive material are very rare. This page explains how nuclear medicine images are taken. It includes videos showing nuclear imaging machines at work. This page has information about the PET scan. PET scans help diagnose a variety of diseases including heart disease and many types of cancer. 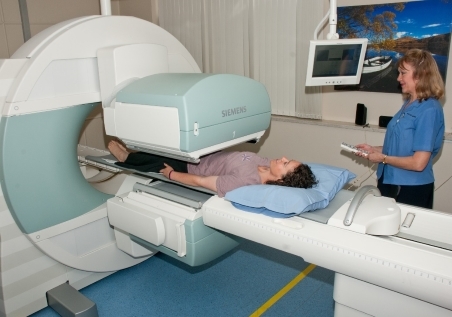 This page contains information about radiation and the risks from having scans and X-rays. These pages have information about the most common procedures carried out by the Christchurch Hospital Department of Nuclear Medicine.